It’s Thanksgiving and time for Marvelicious Toys’ 5th Annual Black Friday Shopping and Holiday Gift Guide! First, Justin, Arnie, and Marjorie run down all the Marvel toys and collectibles on sale Thursday through Sunday this weekend. From Disney Infinity toys to Hasbro figures, listen to find out where the deep discounts are in stores and online! Also this show, shopping for collectors can be challenging. Whether you’re buying for your friend, spouse, or perhaps a holiday treat for yourself, the choices are daunting. Join the Marvelicious hosts as they detail the hot Marvel gifts this year. From action figures to high end collectibles to housewares, shirts, and even a few WTF items, it’s all in this issue! Plus there’s still a few days left to sign up for the Marvelicious Toys Holiday Gift X-Change! Registration closes December 2nd so sign up now to give and get some Marvel goodies this holiday season! It’s an episode more full than your plate at Thanksgiving dinner, so watch now! Annual event gives fans chance to have a Force-full holiday! Springfield, Ill – November 26, 2014 – Today Star Wars Action News, the premier podcast for Star Wars collectors, launched its annual “Sithmas” holiday gift exchange for listeners looking to send a lightsaber to a fellow fan or find a new Speeder Bike sitting on their doorstep. Anyone who has ever participated in a “Secret Santa” gift exchange will be familiar with the Star Wars Action News formula; just register online to receive a gift from a fellow participant and you’ll be assigned to buy a gift for someone else taking part in the program. The “Sithmas Exchange” gives participants a chance to put together a “wish list” of favorite toy lines, characters, and other items they hope to receive, so the gift-giver isn’t left wandering the aisles of Toys ‘R Us or Target without a clue. Minimum total gift cost is $20, although past events have seen listeners go above and beyond to gift the perfect Star Wars item to a fellow collector. Those who wish to participate in the “Sithmas Exchange” can find rules, important shipping details, and a registration form on the Star Wars Action News website. Registration is open until 11:59 p.m. on Dec. 2, 2014. The Star Wars Action News podcast is dedicated to covering Star Wars collectibles of all shapes and sizes. From action figures to art to high-end statues, Star Wars Action News brings listeners biweekly news and reviews, as well as in-depth convention coverage and interviews with toy makers and celebrity collectors. Based in Springfield, Ill., Venganza Media Inc. is a privately-owned multimedia production facility and home to the Venganza Media Podcasting Network. Film fans and collectors worldwide know Venganza as the producer of Star Wars Action News, Marvelicious Toys, and the company’s flagship program, Now Playing Podcast. Since its formation in 2005, Venganza has delivered thousands of hours of entertainment to listeners, while its staff and fleet of contributors have established the company as a premier source for film reviews, celebrity interviews, and collecting news for audiences of all ages. 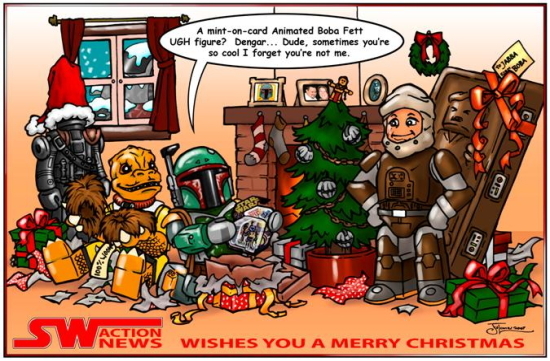 Then keep listening for the Star Wars Action News annual holiday gift guide! This year has gift ideas ranging from $3.00 to over $7,0000! No matter if you’re buying for young or old, man or woman, listen to find what to get the Star Wars collector who seems to already have everything!